The Masterclass explores the shamanic and cybernetic systems of rituals that sustain transformation, and the impact of ritualistic art forms. Divided into groups, the participants engage with the island’s geographical body, serpent mythology and ceremony through daily ritual protocol and feedback. Immersion in 5 unique channels/holons of vision, sound, text, movement and intention/compassion culminates in the discovery of the group-mind’s creative DNA which is then embedded in a morphic field via networked rite. The outcome generates compassionate interpersonal-relations and social connectivity, cultural awareness of ritual practice, amplified creativity and flexibility, and a process of study that triggers new expressions and knowledge of self/identity, world/realities, field consciousness and the embodiment of the mind. Final Product is a digital entity entitled “Morphic Field of Compassion”, embedded with group-mind DNA and field consciousness, which could be re-activated via repeated rituals. The Masterclasss is designed for artists, researchers, students, individuals and groups involved or interested in the creative fields and in the integration of art, science, technology and consciousness research. Certificate of Participation will be provided upon completion of the workshop as an acknowledgement of the process undertaken. 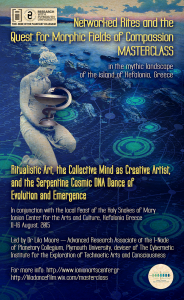 It will be issued by Dr Lila Moore/The Cybernetic Institute for the Exploration of Technoetic Arts and Consciousness. The Masterclass is for 5 days, arrival day is on 11th August. Participation fee is euro 447 (tax and registration fee included), also includes full housing accommodation, breakfast and one local traditional hot meal (lunch, vegetarian or meat according to request). Travelling, insurance, leisure and local transportation expenses are not included. Please send us your application form as soon as possible to speed-up our screening process and ensure your participation. Only 13-15 participants can be accommodated. For those requiring privacy, hotel accommodation may be arranged. Please contact the Ionion Center for the Arts and Culture as soon as possible to secure the best deals on local hotels and all accommodation arrangements. Registered applicants will receive the Masterclass full programme and timetable.